Save, fill-In The Blanks, Print, Done! We recommend downloading this file onto your computer. 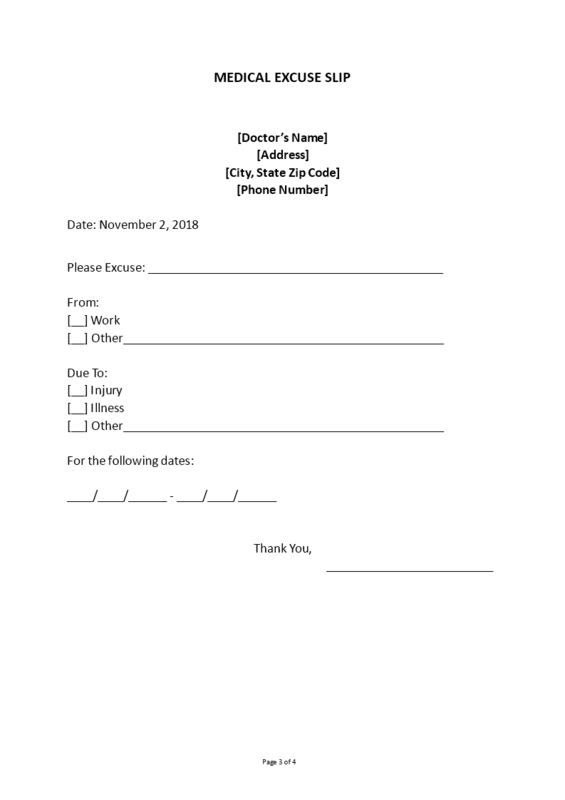 How to make a formal Medical Excuse Slip? We provide a properly drafted Medical Excuse Slip that fits your needs! Type your address and telephone number, flush left on the top of the page. It is not necessary to include your name or title here, it will be included in the closing. Type the date, in the format: month, day, and year on one line below your address and telephone number, flush left. Type the recipient's personal title and full name in the salutation, one line after the recipient's address, flush left, followed by a colon. Leave one line blank after the salutation. Hereby a suggestion: use the recipient's full name unless you usually refer to the individual by a first name. In the first paragraph of the letter's body, you state the purpose of the letter, which is a medical excuse. Make sure to leave an empty line between each paragraph. You can mention the medical excuse like of 'Illness', 'Injury', other'. As you know, communicating in a professional manner will get you respect. Therefore, we support you by providing this Medical Excuse Slip template and you will see you will save time and increase your effectiveness. Please note this template is provided for guidance only. This correspondence should be edited to fit your personal situation. Download this Medical Excuse Slip template now, good luck! Leave a Reply. If you have any questions or remarks, feel free to post them below. Receive the template in another format, for free! Please leave your email address below and we will send you the converted file as soon as it is ready (+/- 5 minutes). No worries we won't use your email for spammy messages or share it with 3th parties.